Miami, Florida is one of the most exciting multicultural cities in the world, offering plenty of sun, beach and style. It is well-known for its white sand beaches and active nightlife, but it also offers cultural attractions, museums, concerts, sporting events, etc. It is made up of many district localities, and maybe in one of them you will find your ideal Miami home to relocate. Why investing in real estate in Miami is an excellent choice? If you are one of those lucky persons that have just moved to this amazing city, first of all – congratulations! Now you might want to know what is expecting you in this amazing and mind-blowing coastal city in Florida. As you could already read in one of the articles on our platform, Miami can offer something to everyone, and most likely, you will love almost every single thing! Miami is unique and special because of its perfect balance and flawless fusion of the everyday, busy life, and the relaxing nightlife. Those who love the latino spirit will, without doubt, enjoy some Cuban influence that is present in Miami. You might want to try some Cuban cigars, or dance salsa in some of the local cafés. This article is a kind of tutorial for newcomers to Miami, to have closer look at the boroughs of Miami where they could move to, or they have already planned to move to. Finding an ideal real estate in Miami is not the easiest thing and there are many factors that make moving to Miami a difficult task, one of which is choosing the right neighborhood. We are here to help you with your fresh start, find your way in your new district and get the most out of it. Top neighborhoods in Miami: Where to move? We are about to reveal to you the top 3 neighborhoods in Miami to relocate. You will get a chance to discover the most notable boroughs of this fascinating city, so you can find the one that fits you. Okay, we can not promise that after reading this article you will know precisely in which part of the Miami to move to, but what we can promise is that you will definitely find some useful information which will help you make a decision. At first, Miami may seem confusing, but it quickly becomes easy to find your way. The geographical heart of the city represents the small group of buildings that make up the downtown area. 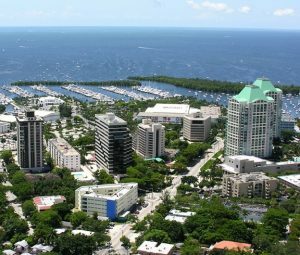 The airport is northwest of the downtown, the beaches are east, Coconut Grove is south, Coral Gables is west, and the rest of the city is north. The city is divided into a lot of districts and the street numbering is relatively straightforward, so it would be a good idea to get familiar with the numbering system. It may be helpful to know that avenues generally run north-south, and the streets east-west. This charming district represents Miami’s first planned community founded in the 1920s by George Merrick. Old Floridian, Spanish Revival and smooth modern homes that you can find here in wide-open streets with canopies trees are making this area a genuinely warm and captivating place. If you are planning to buy a house in Coral Gables, then you should know that they are perfect for families who are searching for sophisticated and refined small neighborhood close to the urban centre of the town. Its real estate is one of the most desirable markets in South Florida offering good schools for your children, plenty of diverse activities, clubs and bars. Coral Gables is located close to highways and you can get really fast to the beach if you own a car. Houses here were built in a Mediterranean style and the best architectural exemplars of that era have Spanish-style tiled roofs. The majority of Coral Gable residents are old Miami families and rich immigrants from Latin America. It is considered one of the most important communities in Florida and we can say without any trouble that this Miami neighborhood represents a piece of paradise on Earth. Believe it or not, Coconut Grove back in 1960s was a haven for hippies and it still maintains remains of its arty and psychedelic roots, although now it’s full of modern homes and large estates. The intersection of Main Highway, Grand Avenue and McFarlane Road are creating this district’s heart. Right in the center of it all is CocoWalk, a huge entertainment complex with restaurants, shops and tons of nightlife, which makes this area very popular both for locals and tourists. Much of Coconut Gave is close to the waterfront, and if you are moving to this neighborhood of Miami you must know that homes tend to be pricey, but if you are looking for something that is a little less maintenance, the condos here generally cost less. This borough of Miami has one of the most beautiful cityscapes in the world. With its newly constructed lofts and condos with many storeys, Downtown Miami represents a well-established neighborhood. The shopping and good restaurants are close, as well as the downtown offices, the beaches and the airport. Little Havana in this area is one of the most famous sections in town and it is known for its great food and Cuban culture. Most of the population here are Cuban fugitives. If you find interesting this part of Miami to move to, it is good to know that the downtown condo overflow is making excellent rental and for those who are investing in real estate in Miami for the first time. Also, the older neighborhoods east of Biscayne Boulevard have fallen from their top-dollar prices and now are more affordable, so Downtown Miami is full of opportunities for your relocation.